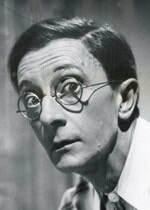 George Frederick Joffre Hartree (30 November 1914 – 27 October 1988), known as Charles Hawtrey, was an English comedy actor and musician. Beginning at an early age as a boy soprano, he made several records before moving on to the radio. His later career encompassed the theatre (as both actor and director), the cinema (where he regularly appeared supporting Will Hay in the 1930s and 1940s in films such as The Ghost of St. Michael's), the Carry On films, and television.